In this tab, you can define refractive index profiles of up to 10 different fibers. You can give a name to each of them (e.g., a product name or any remark helping you to identify that fiber). Switch between these data sets by clicking on the selection tool at the top. The entered data are stored automatically, so that you still have them the next time you start the software. In the text areas at the bottom, you can get some help texts and learn what features are available in other software. 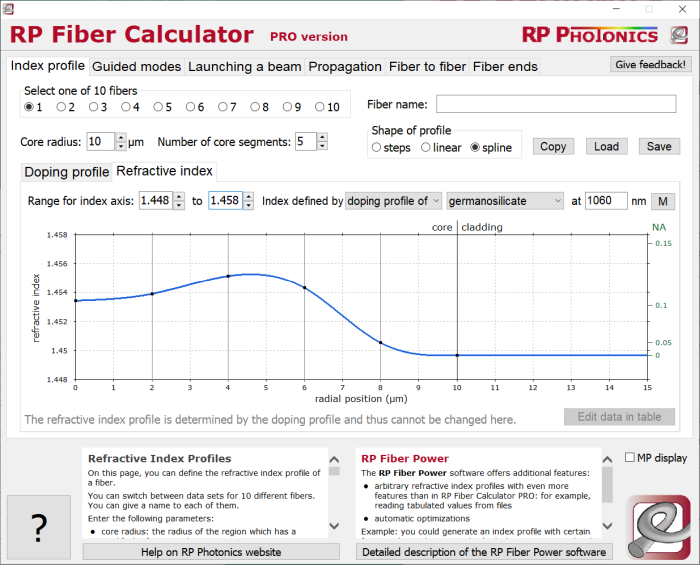 For example, in RP Fiber Power you could generate an index profile with certain features (some bumps or dips) which you can control with a set of parameters (such as a bump height and width). You could then have these parameters automatically optimized such that certain mode properties are obtained. Generally, RP Fiber Power is far more flexible since it offers a powerful script language. Core radius: this is the radius of the fiber core, i.e., the region which has a modified refractive index. Around the core, there is the cladding, having a constant refractive index. You can modify the core radius in steps of 1 μm by using the small arrows just write of the input field; when holding the Ctrl key pressed, you change the radius in smaller steps of 0.1 μm. Number of core segments: the fiber core region is subdivided into some number of segments for which the refractive index can be determined. The more core segments you choose, the more complicated index profiles you can define. Type of profile: you can have an index profile defined via steps (with constant index within each segment), with linear interpolation or with a cubic spline interpolation for smooth profiles. For example, for a simple step-index fiber, take a single core segment and choose a step profile. Further in the “Refractive index” tab you can enter the index range, i.e., the range to be displayed on the vertical axis in the diagram below. It should be at least as large as the range of indices used for the profile. Choose “Index defined by diagram” in order to directly determine the index values. In order to change the refractive index of some segment, simply click with the left mouse button on the vertical line which indicates its left boundary. (In case of step profiles and for the cladding, you can also click anywhere in the diagram.) If you click with the right mouse button, you can edit the numerical value of the refractive index. With the button “Edit data in table”, all index values can be edited as numerical values. Choose “Index defined by doping profile” (PRO feature), if you want the refractive index to be calculated from the doping profile (e.g. of germania in silica) which you can edit in the “Doping profile” tab. In that case, the refractive index can become wavelength-dependent, i.e., chromatic dispersion is included. The material data are contained in a file which you can open and edit by pressing the “M” button. By adding a function named n_myfiber(r,l), for example, you would define the material named “myfiber”, which you could then select in the material selection box. Choose “Index defined by expression” (PRO feature), if you want to use your own refractive index data, e.g. in the form of Sellmeier equations. The index can depend on the radial coordinate and on the wavelength. A simple example for such a formula: 1.45 + (if r < r_core then 5e-3*(1 - (r/r_core)2)) defines a parabolic profile. You could also refer to functions defined in the material data file. The free version supports only the first option (direct input of index profiles). The diagram shows you the refractive index profile. On the right side, it has an axis which shows what numerical aperture (NA) a step-index fiber with a certain core index would have. 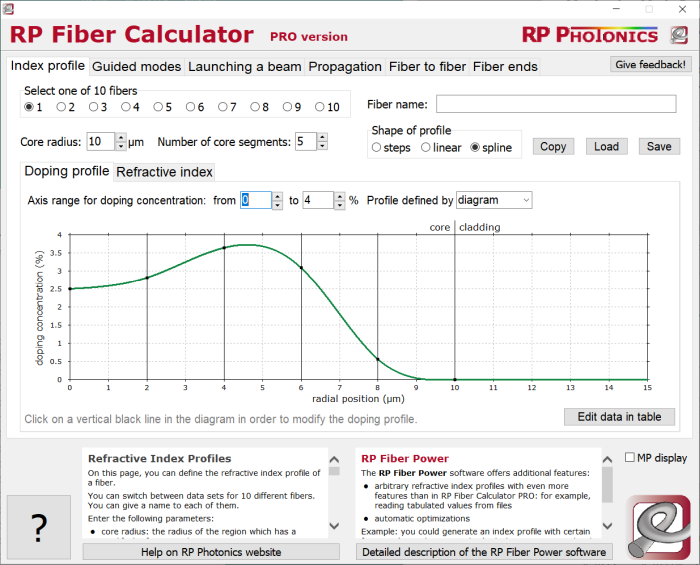 RP Fiber Calculator PRO version offers a very handy feature for displaying the most important mode properties in a window below the displayed index profile. Just activate “MP display” (the check box near the bottom right edge of the form) in order to open another panel at the bottom. On the left side, you can enter one or several lists of expressions, and their values will be displayed on the right side. These displays can be automatically updated whenever you do a change to the index profile. in order to display the effective mode area of the fundamental mode at 1550 nm and the cut-off wavelength of the LP11 mode. As you see, you can also mathematically transform the values and use formatting instructions to get rounding to some number of valid digits and some units. Besides, you can use a wide range of mathematical standard functions such as abs(), trunc(), round(), sqr(), sqrt(), exp(), ln(), lg(), sin(), cos() and sinh(), and the standard arithmetic operators (+, −, *, /, ^). Apart from arithmetic expressions, you can use strings – for example, string constants in single or double quotes. If you develop optimized fiber designs, you usually have to observe several mode properties. For a single-mode fiber, for example, you may need to reach desired values for the effective mode area, the cut-off wavelength of the LP11 mode and possibly a certain value of the group velocity dispersion (GVD). Obviously, it would be tedious to look up all these properties elsewhere after each change of the refractive index profile in order to decide on further changes. The explained feature of the PRO version makes this more convenient, as you can get mode properties displayed directly where you edit the index profile. The penalties for deviations from the ideal mode area and cut-off wavelength are weighted by dividing them by corresponding tolerances. You may then modify the index profile simply until you get the smallest possible FOM value. Instead of observing several target properties, you can focus on the minimization of a single number. Behind various input fields, you find small arrows for increasing or decreasing the numerical value by clicking with the mouse key. For floating-point values, you can produce 10 times smaller changes by holding the Ctrl key pressed.